When I first heard that Ryan Gosling was writing and directing (but not appearing in) his own feature-length film, I got pretty intrigued. When I saw the weird as hell trailer, I got reasonably excited. It seemed that this chiseled Canadian muse took a stylistic page from his greatest patron: the inconsistently attractive Danish oddball Nicholas Winding Refn, writer/director of such shockingly violent fever dreams as Only God Forgives, Valhalla Rising, and Bronson, and also the reasonably accessible and tame-by-comparison Drive. Gosling’s repeated participation in Refn’s projects showed his true colors: he’s not just a Hollywood hunk (although he is also that); he’s a surprisingly thoughtful, layered, artistic, yet unpretentious guy. How about that? The Plot: As their derelict community literally crumbles around them, a mother (Christina Hendricks) and son (Iain De Caestecker) embark on separate quests to procure funds to keep their home. The mother, Billy, takes a job at a mysterious underground gore-themed nightclub, and the son, Bones, starts stripping houses for copper. Things start to get even worse when Bones’ activities attract the attention of local Satan figure Bully (Matt Smith) and Billy receives that certain kind of unwanted attention from her boss Dave (Ben Mendelsohn). When their neighbor Rat (Saoirse Ronan) tells Bones about a drowned city at the bottom of a reservoir and a strange curse, a magical solution to their sinister problems might just be within reach. Even more so than Only God Forgives and Valhalla Rising the experience of watching Lost River feels like a dream. Or rather, it feels like a nightmare. This isn’t a horror movie, but have you ever had those truly unsettling dreams where nothing really too inexplicable happens, but for some reason you just know there’s something horribly wrong going on? Like that scene in The Road where the kid, the kid who is surviving in a post-apocalyptic, cannibal-ridden world, wakes up from a nightmare about a windup toy penguin, terrified out of his mind for no reason except that no one wound up the penguin. That’s Lost River. Everything that happens is unusual, but nothing is fantastical. This brilliantly cultivated atmosphere is incredibly mesmerizing and even enchanting, but also deeply uncomfortable at times. You do end up feeling stuck in this movie, which in this case perfectly suits the film; the main characters are essentially trapped in a horrible nightmare, so it’s only fitting that the viewer should feel the same way. I don’t mean to imply that watching Lost River is an unpleasant experience; it’s not. I loved it, actually. For all the nightmarish qualities, Gosling holds you in with a beautiful visual aesthetic. His camerawork certainly has a Refn-esque quality to it, but not in a derivative way. He takes normal places, like an old house or a nightclub or a gas station or a city street, and through manipulation of light and clever camera angles, he transforms them into more magical and sinister settings. It’s not the places themselves, necessarily, but the way he films them that makes them seem like they’re from a dream. Of course, sometimes you get something genuinely odd and creepy, like an abandoned zoo. When you’re filming in an abandoned zoo, you don’t need to try very hard to make it seem off-putting and unsettling. Aiding Gosling in his efforts to create this unnervingly familiar and strange world is an excellently melancholic soundtrack of electronic lullabies and forlorn love songs by Johnny Jewel, who fans of the Drive soundtrack will recognize as a member of Chromatics and Desire. The music itself is beautiful enough to listen to, but when paired with this story and these characters and Gosling’s haunting visuals, it transcends to that nice little rank of “perfect soundtrack.” I could not imagine better music to fit the film. Give it a listen. Side note: our main characters are named Billy and Bones. Now, normally naming tricks like that irritate me, because usually it’s a swift and unwarranted nudge in the ribs saying, “See, I read a book before I wrote this script,” and most of the time there’s no justification for it beyond making the writer feel clever about himself. In this case, though, the character names are mentioned sparsely and I’m pretty sure never in the same scene. It’s so subtle, actually, that it didn’t hit me until after the fact. It’s so rare to have someone actually earn their naming reference, but here it is: Billy Bones is a character from Treasure Island, the sole possessor of a map that leads to immeasurable wealth, but rather than going to find the treasure, he commits himself to the life of a booze hound and eventually drinks himself into an early grave. Billy and Bones have the means to escape their crumbling home through the entire film, but just can’t make themselves do it. Isn’t that better than naming your vampires Adam and Eve? It seems that my review suffers from undue loneliness in its positivity. 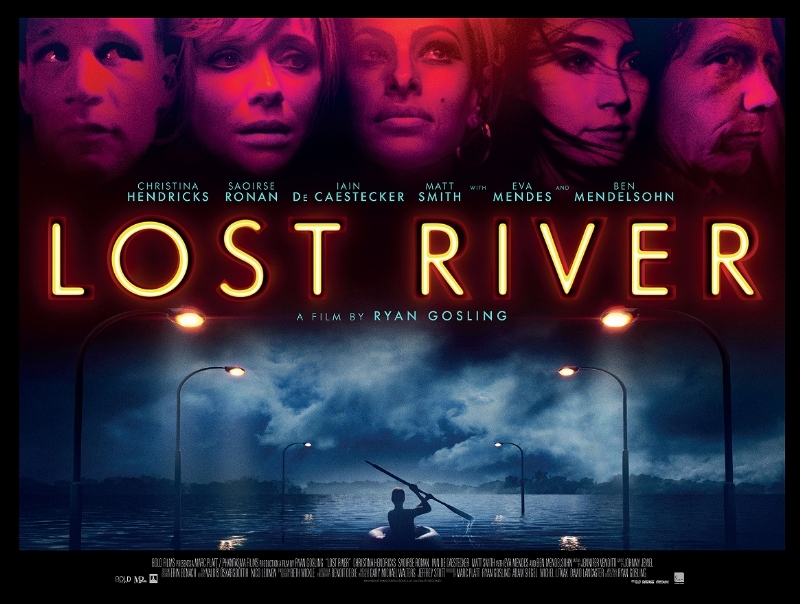 Most critics and audiences panned Lost River as pointless, plotless self-indulgence. Of course, most people said the same things about Only God Forgives, and look how that turned out? People love weird, but only carefully cultivated, prescription dosages of it. Like Birdman weird. Artificial weird. When it comes to something that genuinely earns its weirdness because it would simply be wrong for it to be normal, then people don’t like that. As I said, watching Lost River feels like getting lost in a particularly odd, but uncomfortably true nightmare. When it ended, I found myself in a daze, as if I had just taken a long nap at the wrong time of day, and my body didn’t quite know how to adjust to the interruption, to the disagreement between time of day of state of mind. I don’t think any other movie has had quite the same effect on me before. Rest assured, I will re-watch Lost River someday, though perhaps not too soon.